Priority crossings for possible culvert replacement or retrofit are represented by green dots and triangles. If these are not visible, use the plus sign to zoom in. You can layer in locations for the top 5%, 10% and 15% of crossings with the highest restoration potential as estimated by landscape modeling; darker green represents more potential for restoring aquatic connectivity. Green dots are crossings that have been assessed in the field and the potential for restoring aquatic passability is reliable. Green triangles are crossings that have not yet been assessed and the restoration potential is hypothetical. These are high priority crossings for assessment. Data are from the Critical Linkages Phase I (2016). Animal movements (individuals or their offspring) across the landscape are important for maintaining healthy wildlife populations. Climate change is likely to result in changes to habitat conditions (temperature, rainfall, vegetation) that will require many species to adjust the areas they occupy. Restoring and maintaining landscape connectivity sufficient to allow wildlife populations to adjust their distribution over time is a critically important strategy for adapting to climate change. Replacing culverts that block the movement of aquatic organisms (like fish, crayfish, and turtles) is one way to restore river and stream continuity and enhance the resiliency of wetland? and aquatic ecosystems. There are approximately 30,000 mapped stream crossings in Massachusetts and many more that are not mapped. Some culverts are severe barriers to the upstream movement of aquatic organisms; others represent little or no barrier at all, and there are many in between. Without field-based data on the passability of these crossings, it is difficult to identify those sites where culvert replacement would be likely to do the most good. Tools are now available to assess the passability of road-stream crossings and model their effects on aquatic connectivity. Volunteers and technicians working with state agencies and environmental organizations are using protocols from the North Atlantic Aquatic Connectivity Collaborative (NAACC) to assess the passability of bridges and culverts in the field. These data are used by the University of Massachusetts Amherst, The Nature Conservancy and others to model river and stream networks and identify crossings where upgrades would result in the largest benefits to aquatic connectivity. Field assessments and passability scores used with landscape-based modeling can help target specific culverts for replacement or retrofit. In areas where crossing assessments have been done, results from landscape models can be used to set priorities for culvert replacement. In other parts of the state where field assessments have not been done, we lack important information about the passability of those structures and cannot effectively prioritize crossings for upgrades or replacement. 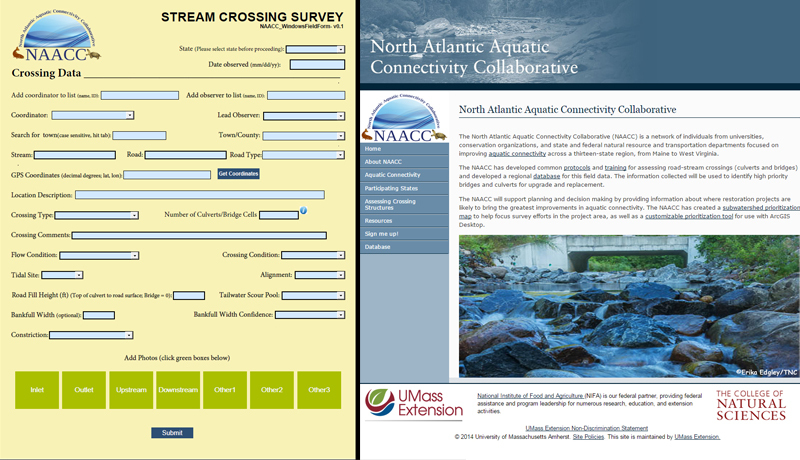 Screen shots of the NAACC web site and digital data form for road-stream crossing assessments. The North Atlantic Aquatic Connectivity Collaborative (NAACC) is a network of state and federal agencies, academic institutions, and large and small conservation organizations working together to assess road-stream crossings and support efforts to replace substandard structures and restore aquatic connectivity. The Collaborative is open to all groups who are willing to use the NAACC protocols to conduct assessments of road-stream crossings. The NAACC relies on local groups made up of lead observers and survey assistants and led by a local coordinator to collect data and enter it into the NAACC online database. To be certified to submit data via the online database, coordinators and lead observers must complete protocol training (in person or online), field training, and shadowing an experienced data collector for 20 assessments. Data are then scored for passability and made available for public viewing and download. Local groups who collect the data receive the following support from the NAACC. If you would like to get involved in the NAACC, see if there are groups participating in your area, or work with others to create your own group, visit http://www.streamcontinuity.org.